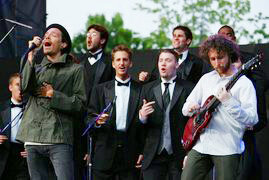 Ithacappella and Incubus Rock L.A. Interested in learning more about Ithacappella? More information can be found on their website. Read how the group started and see a video of their performance in California. Find out how you can be part of the show. The unprecedented opportunity materialized after an Ithacappella video appeared on YouTube. The group’s cover of Incubus’s “Dig,” featuring Jon Connors ’07 and Chris Rossi ’08, was viewed over 2,000 times during its first week on the Internet. Eventually the video was reposted on Incubus Online View, a fan forum, where it came to the attention of Incubus front man Brandon Boyd and band manager Steve Rennie. When it came time to perform that evening, the group stood on a circular stage that rotated around and placed them in front of the huge crowd. “We’re backstage getting ready to go and Brandon looks at us and says, ‘One piece of advice: don’t screw up!’ ” recalls Garrett Deming ’08. Deming looks forward to the long-term implications of their unique performance. Because the sound check and the performance were recorded by an Incubus film crew, the group might be featured on the next Incubus DVD.